Hey! I've decided to put together a bare bones website devoted to showing pictures from my trip in Japan. Mostly this site will just be images links with a bit of text to describe the images. 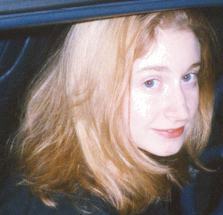 A big thanks to my host Mom who let me use her scanner to scan all these pictures. I hope this helps keep people up with what I'm doing. These images might take a while to load so please be patient! And, as always, E-MAIL ME carasel@graffiti.net. 2/14/00--Happy Valentines!! Yuuki Matsuri Hokkaido trip pictures up and this time the weekly email is placed with the pictures as they kind of go together. 1/24/00--Finally! A picture of me and Taka! 1/17/00--A few images from my Christmas break and a few of my weekly group emails (scroll down to the bottom of this page) of what I've been up to. 1/6/00--Only have one new image to put here, more to come. 12/25/1999--well I've decided to start putting my weekly emails up here too, but unfortunately they are all at school and the labs are closed for the holidays. 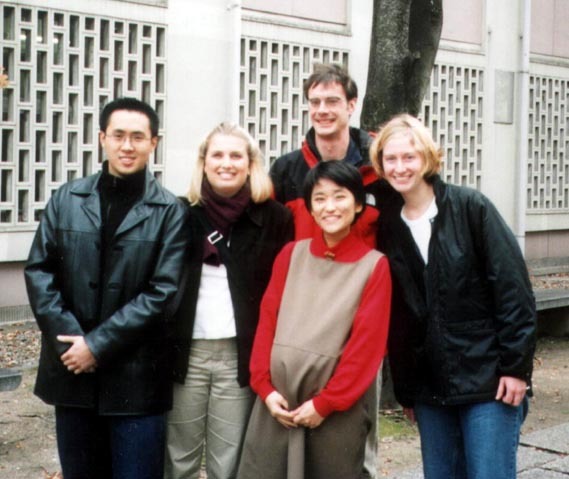 A picture of the four of us who went to Hokkaido. This was at one of the "scenic stops" we made (where while looking at beautiful scenery you can also spend your money at the conveniently located gift shop). Here is an example of one of the most impressive sculptures of the winter festival. Me and Lisa on an ice slide in Hokkaido. Here I am at Kyomizu temple stading in front of a love god with his satanic looking messenger bunny (not in Hokkaido this one is from Kyoto). Here's a picture just for James! Happy Valentines! Here we are at the Kobe Luminaria (a huge lights display) a couple of weeks before Christmas. A picture of me and my brother Mike (you'll see a lot of those in this batch) in front of my host parent's house in Kobe. A picture of me and my brother Mike sitting in front of the Imperial Palace in Tokyo we were there the day before the Emperor's birthday and so we got to see even less of the Imperial palace than usual because security was tightening up. On the emperor's birthday the Emperor and his family make apperances 3 times that day so the place is normally packed and so the security guys were pretty suspicious of everyone. 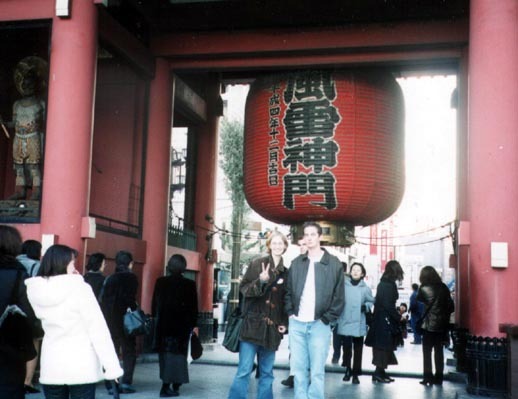 A picture of me and my brother Mike at Asakusa Temple the temple part is actually really only a small part of it. Now it is surrounded by various shops selling quasi-traditional Japanese goods. A picture of me and my brother Mike in Ginza, a huge shopping district in Tokyo. 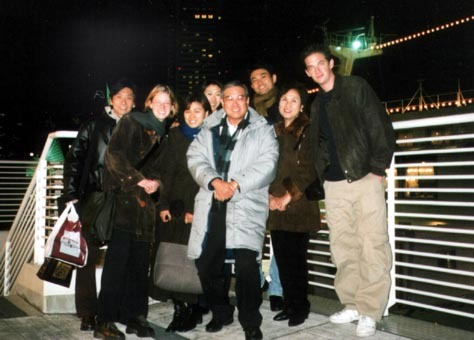 Me, Mike, and my host family (including the rarely seen host brother--with his wife--and host sister--with her boyfriend) on Christmas day after we took a cruise around the Kobe harbour. A picture of me snowboarding, and I really like this one, because you can imagine that I might be standing up soon, when in actually I never got much closer (at least after the nasty fall I had after my 3rd time down the hill) to a standing position than in this photo. This is a picture of my Japanese class from September to December. As of January I'm being bumped up to the next class up (through no merit of my own, my class is being disbanded because 2 of our 4 members are leaving to go on a work term). The woman in the middle is our Prof. Here I am with some friends at my host Mom's Church's bazaar. This was a fun day because at one point all the volunteers took off to have lunch leaving me by myself behind the counter to deal with customers in Japanese (and it also didn't help that I'd been out until three the previous night). This one is a picture of my university's festival. You can see all the booths that were selling food like crazy in the backgound and the red circle indicates Sarah and Junky (his nickname, he also kind of reminds me of Doogie Howser, have I mentioned the Japanese guy I met who I thought looked like David Cassidy? Most people kind of look at me funny when I say this, but he really *did* look like David Cassidy). Here's a cute picture of two friends (Julia and Debbie) on our first trip to Kyoto. The colours of the leaves that day were really beautiful. Me and some trees in Kyoto on the same trip. The weather that day was gorgeous. A beautiful garden (also in Kyoto and if you really bug me I can find out the name for you). Me in my host family's living room(warning big picture!). Me, Sarah and Marianne on our way to a welcome party that was also a costume party--wigs courtesy of Marianne's host Mom--on October 22. 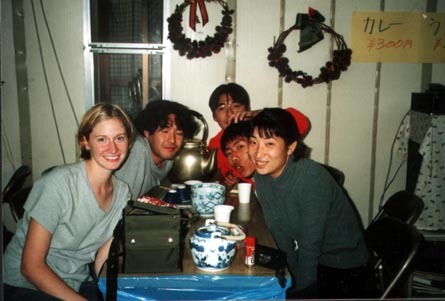 It became a costume party because all the exchange students were going to Hiroshima for Haloween and wouldn't get to party there. At the welcome party with some friends, after a quick wig change. Me in Habourland at the Kobe coast--it's a date spot but that day I went with the cousin of my host parents and we watched a Halloween play. This is me and Sarah in front of the old Hiroshima city hall that is preserved to remind people of the damage caused by the atomic bomb at the Peace Memorial Park and atomic bomb museum. This was a Kabuki performance put on by the Konan Kabuki club with special guests from a Kabuki club in Australia (this picture is of the Australian production, a comedy that was quite hilarious--not that I understood any of the actual words spoken). Me and my friend Sarah in a temple on Mt Koya. My birthday party on October 13 (the day before my birthday) at a Japanese restaurant. Me and my best friend: my ketai denwa! Me in Tokyo just outside of Shibuya Station (with Taco, the elder brother of my Japanese friends in Canada and Zush a friend of his).